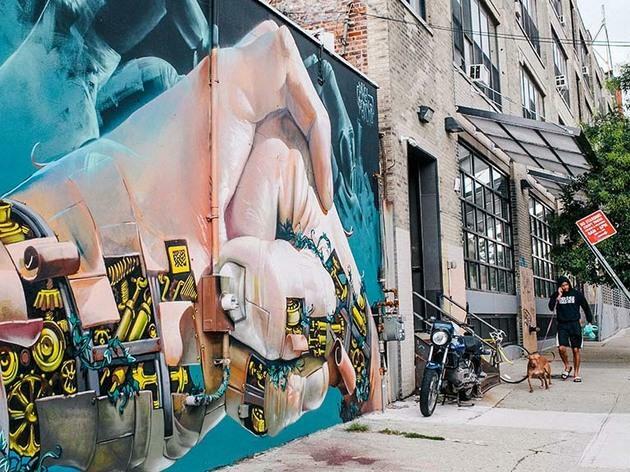 Forget the museums in New York and spend a day taking in some street art. 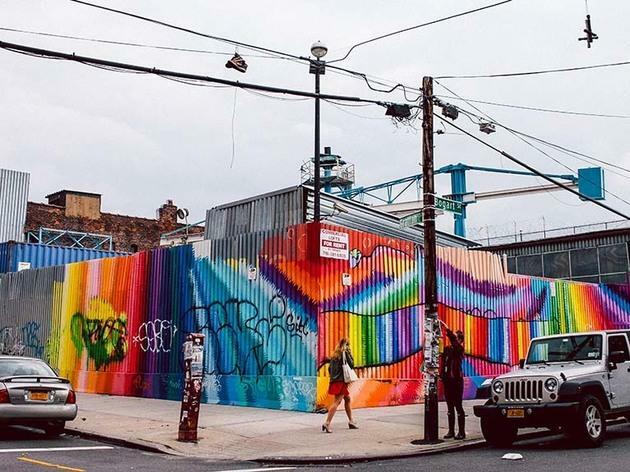 While New York is a true mecca for seeing street art and graffiti, we recommend you take the train to Bushwick—which is now officially the seventh most-stylish neighborhood in the world (according to Anna Wintour, anyway). You can use the travel time to wonder what your tag would be. • Get off at Morgan Ave and take the Bogart St exit. 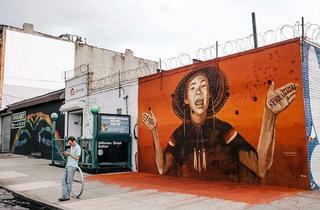 Forget the museums and spend a day taking in some street art. 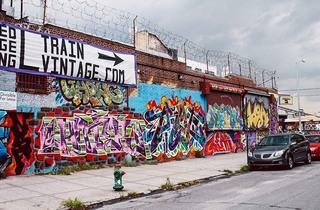 Take the L train, and use the travel time to wonder what your tag would be. Get off at Morgan Ave and take the Bogart St exit. 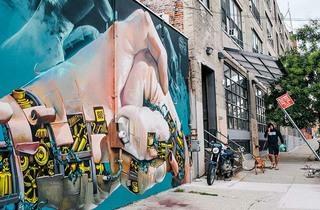 Make a right off the subway and check out the huge Missed Connection billboard painted on the side of a building on Bogart St—it's a woman looking for a man she saw walking his cat in the area, asking him to call her "if you nasty." 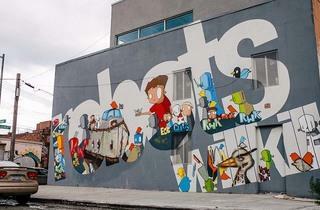 It’s an ad by hand-painted mural company Colossal, but no less awesome for that. 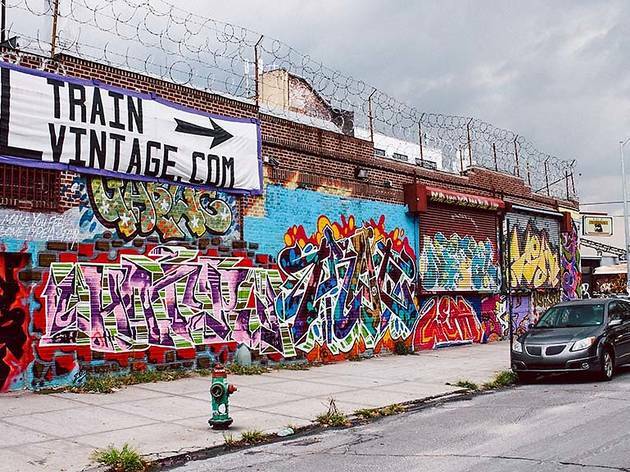 • Head south on Bogart St and make a right toward graffiti paradise Siegel St. Refuel with a delicious (and virtuous) Almond Chunky raw-chocolate bar at Fine & Raw (288 Siegel St, 718-366-3633, fineandraw.com). 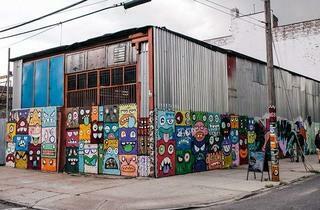 • Walk up Seigel St toward White St and feast your eyes on an full-block-long concrete canvas. • Walk north along White St and admire ViceVersa Vintage (71 White St, no phone, viceversavintage.com), a cool second-hand clothing store which is creatively tagged on either side of the entrance. 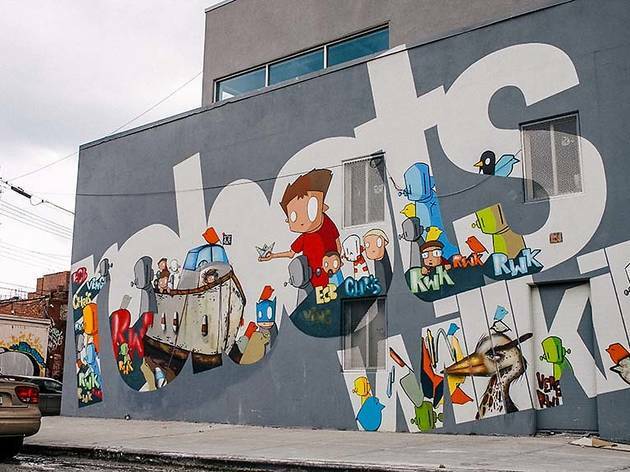 • Take McKibbin St back to Bogart St. Make a right on Bogart and walk south to peep the mural of the namesake bird over the doors of Swallow Café (49 Bogart St at Grattan St), and you’ll be back to where you started. But don’t hop back on the subway just yet! 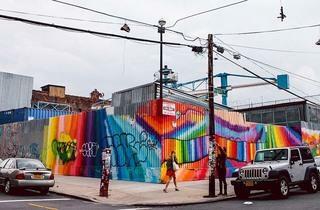 • Cross to Grattan St to see a stunning, colorful spray-paint rainbow almost immediately on your right. 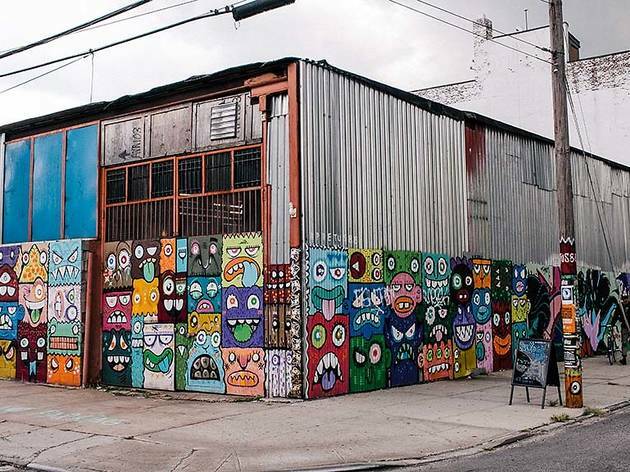 • Take a left onto Morgan Ave and get an eyeful of art—from the amoeba-style tag on the corner to the playful depiction of monsters with their tongues out further down the road—courtesy of street artist Phetus. 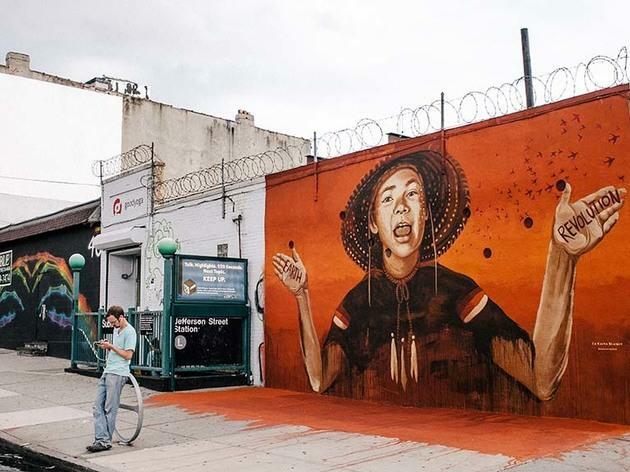 • Walk a few blocks east, to the corner of Wyckoff Ave and Troutman St, and marvel at Dasic Fernandez’s Hand of Protest mural, which just dried in August.